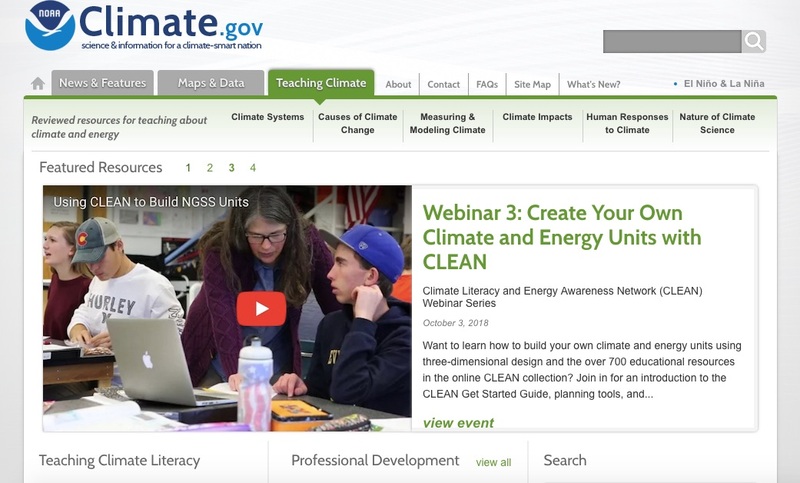 Below is a collection of free online climate literacy resources for teachers. Most resources shared here are intended for students in grades 6-12. To suggest a resource, report a broken link or ask a question, email info@mauihuliaufoundation.org. 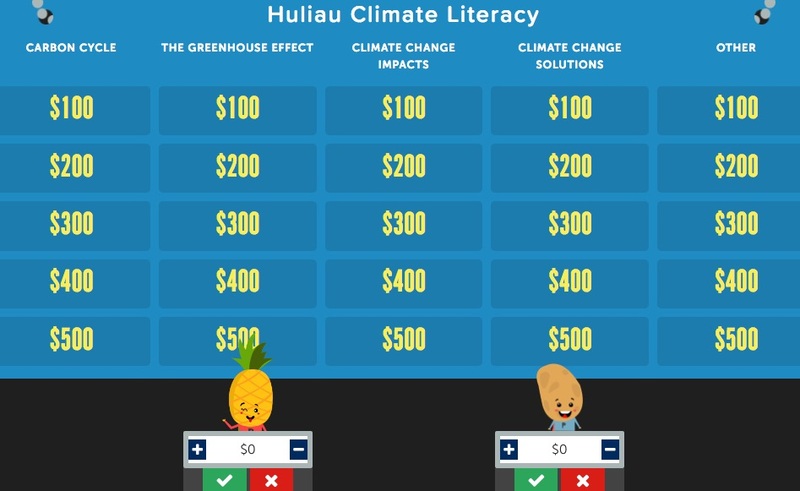 This page contains separate sections for Huliau Climate Literacy Project activities, resource collections, videos and educational resources for teachers. 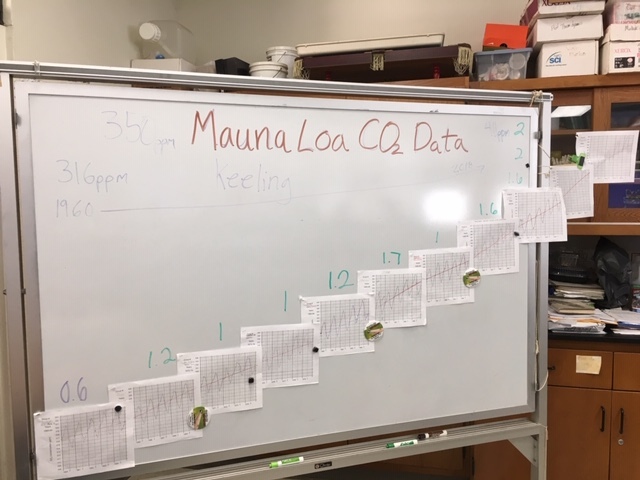 These are individual lessons that have been created or adapted as part of our Huliau Climate Literacy Project in partnership with science teachers on Maui. 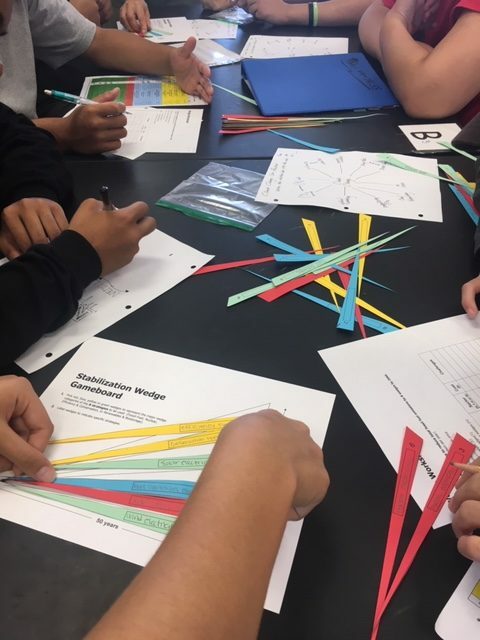 You can contact us to set up a meeting and we will help you design a custom 1-4 week lesson plan for your class in alignment with NGSS. Eventually we will be putting the activity descriptions on-line. For now, the section below is just to give you an overview of the curriculum. 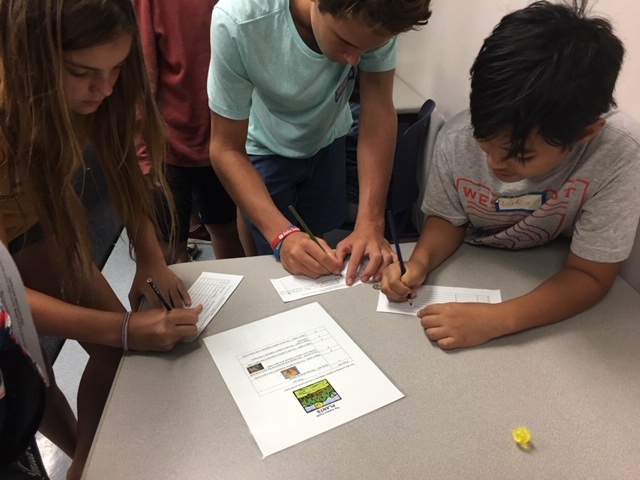 In Unit 1 students learn about human impacts on the global carbon cycle by playing the carbon cycle game and the carbon sinks and sources card game. They then go on to graphing the amount of carbon dioxide in Earth’s atmosphere from 1960 to present day and learning about the greenhouse effect. 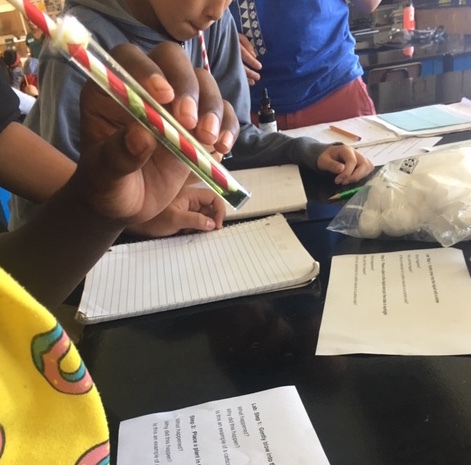 In the lab activity students blow in to test tubes with a straw to see how carbon dioxide makes water more acidic and how introducing an aquarium plant absorbs this extra carbon dioxide. We will later refer back to this experiment in Unit 3 with ocean acidification. Unit 2: What is Changing with Climate Change? In Unit 2 students learn what climate change is, the difference between climate and weather, and what factors create Earth’s diverse climates. 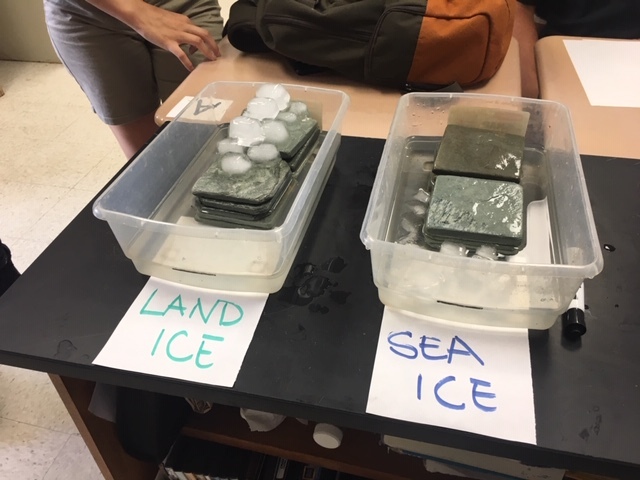 Students they learn about climate change impacts such as melting glaciers, sea level rise, stronger storms, ocean acidification and coral bleaching. For each of these impacts students learn about what causes them, how scientists study them and what effects they have on humans and natural systems. 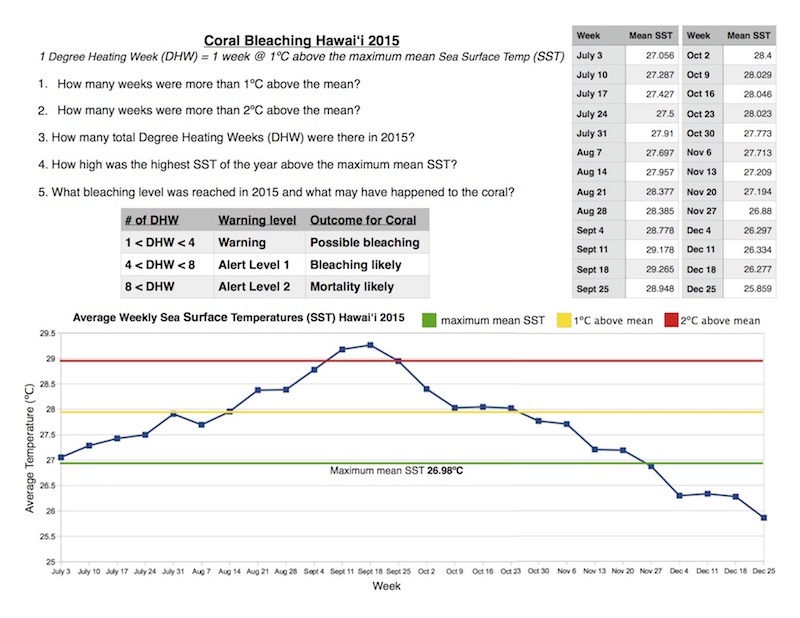 The main activities for this unit include analyzing tide gauge data during large storm events and sea surface temperature data from Hawaiʻi’s 2015 coral bleaching event. There is also a short observation lab to demonstration how land ice contributes to sea level rise. This unit can be completed in 1-2 weeks. In Unit 3 students learn about solutions to climate change such a renewable energy and building more sustainable and resilient communities. This can also include a discussion and/or activity about adaptation and mitigation. Students learn about the Paris Climate Agreement and other related problems such as air pollution which are motivating some countries to act on climate change. We also learn about Hawaiʻi’s goal of 100 renewable energy by 2045. In addition, we discuss facts and fictions about climate change and why people tend to disagree about this important issue. This unit can last between one class session and one week depending on which activities are chosen. 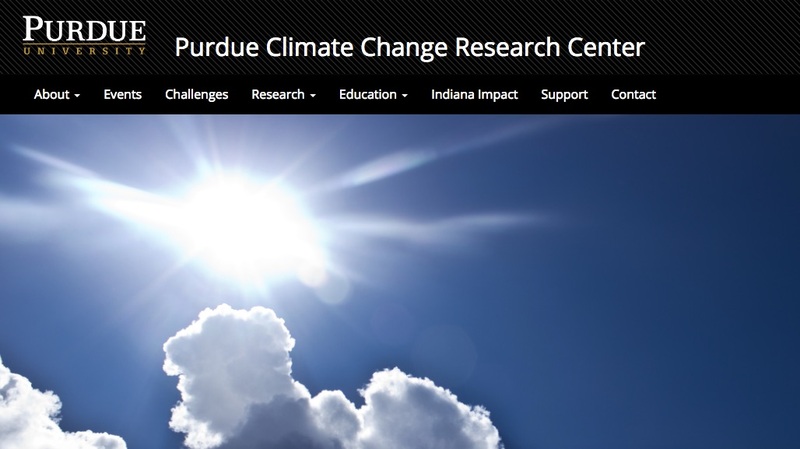 This section contains websites that offer entire curricula relating to climate change. Click on the “learn more” links for our descriptions of each resource and click on the photo to go directly to that resource website. 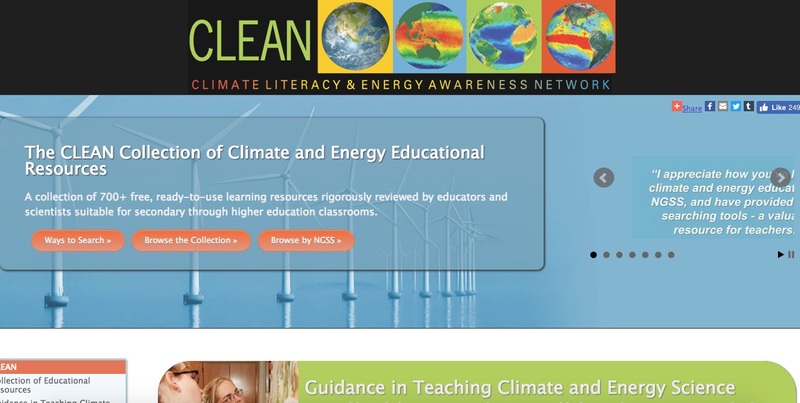 Climate Literacy and Energy Awareness Network (CLEAN) is a collection of 700+ free, ready-to-use learning resources rigorously reviewed by educators and scientists suitable for secondary through higher education classrooms. This is one of our favorite resources! You can search by topic, grade level, resource type or NGSS standard. EarthLabs units offer sequences for learning science concepts through hands-on experiments and data analysis at the high school level. They offer nine modules of labs relating to Earth science and climate change. The project is funded through an Environmental Literacy grant from the National Oceanic and Atmospheric Administration (NOAA). With NOAA’s Data in the Classroom, students use real-time ocean data to explore today’s most pressing environmental issues, and develop problem-solving skills employed by scientists. Access online and classroom-ready curriculum activities with a scaled approach to learning and easy-to-use data exploration tools. Modules include El Niño, sea level rise, coral bleaching and water quality with ocean acidification coming soon! 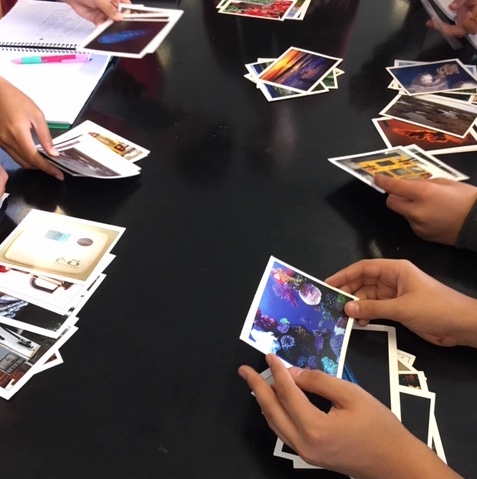 UCAR’s (University Corporation for Atmospheric Research) Center for Science Education Teaching Boxes are themed collections of classroom-ready educational resources to build student understanding of science, technology, engineering, and math (STEM). 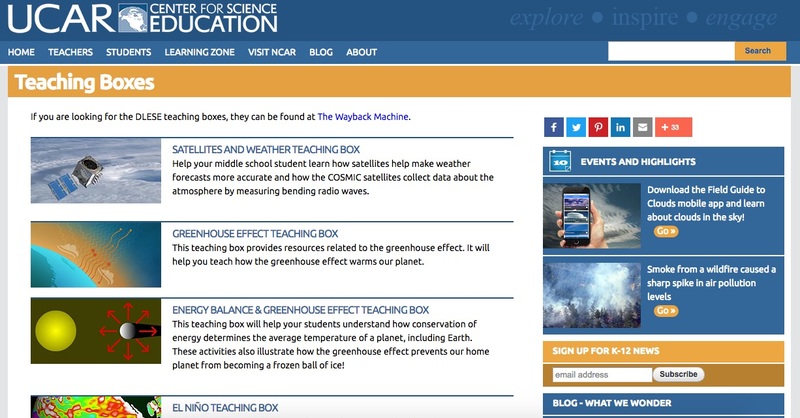 Resources highlighted within teaching boxes are from various science education programs and all have been vetted by the UCAR Center for Science Education team. They include several boxes relating to climate change topics such as the greenhouse effect, satellites and weather, Earth’s energy balance, climate and water, and many more. ExplainingClimateChange.com provides a set of peer-reviewed, interactive, web-based materials for upper high school to help learners visualize and understand the underlying science of climate change. There are 9 lessons on various aspects of climate change which include interactive learning tools and quizzes. These are fairly advanced and may be best for self-directed learning, student homework or teacher education. This is a link to a downloadable pdf document complied by the North American Association for Environmental Education. Each unit ties a series of high quality lessons into a coherent sequence of learning opportunities appropriate for a certain grade band. Each of four grade bands is covered: K-2, 3-5, 6-8, and 9-12. 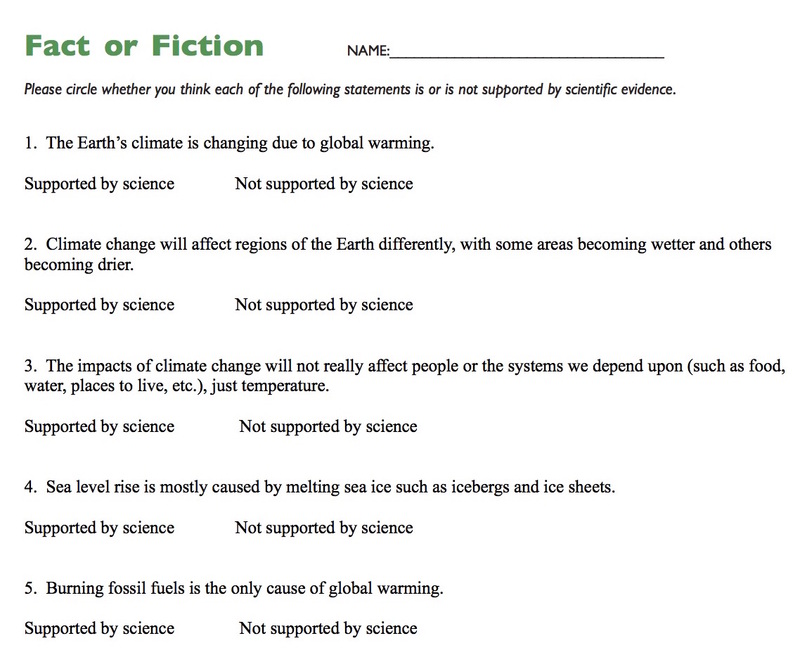 For each grade band, you will find a chart with relevant NGSS standards and a clarification of how each standard is relevant to climate change. Teach Engineering offers a large collection of STEM curriculum for all grade levels searchable by type, grade level, subject area or engineering standards. This includes many lessons and activities exploring clean energy sources, the greenhouse effect and weather. 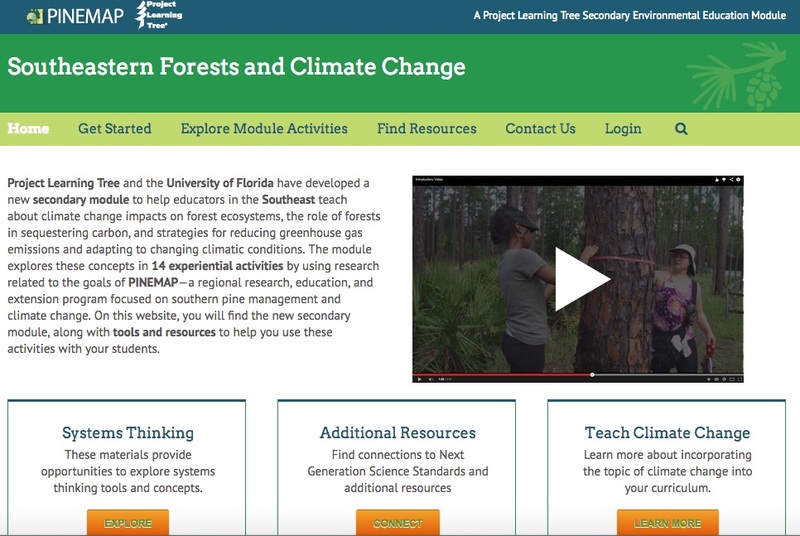 Project Learning Tree and the University of Florida have developed a new secondary module to help educators in the Southeast U.S. teach about climate change impacts on forest ecosystems, the role of forests in sequestering carbon, and strategies for reducing greenhouse gas emissions and adapting to changing climatic conditions. The module explores these concepts in 14 experiential activities. While the lessons are created for educators in the Southeast U.S., many of them are relevant to climate change globally or can be adapted for other places. 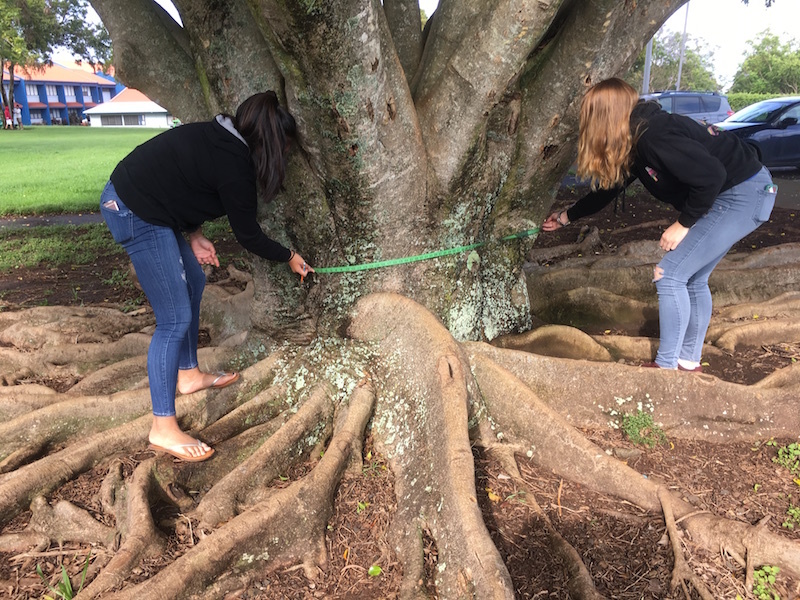 Environmental Literacy and Inquiry (ELI) is an inquiry-based middle school curriculum that uses geospatial information technologies including GIS and Google Earth to investigate environmental issues. The Web site includes curriculum units Energy, Climate Change, and Land Use Change. Tectonics is a series of geospatial investigations designed to enhance the middle school Earth science curriculum. 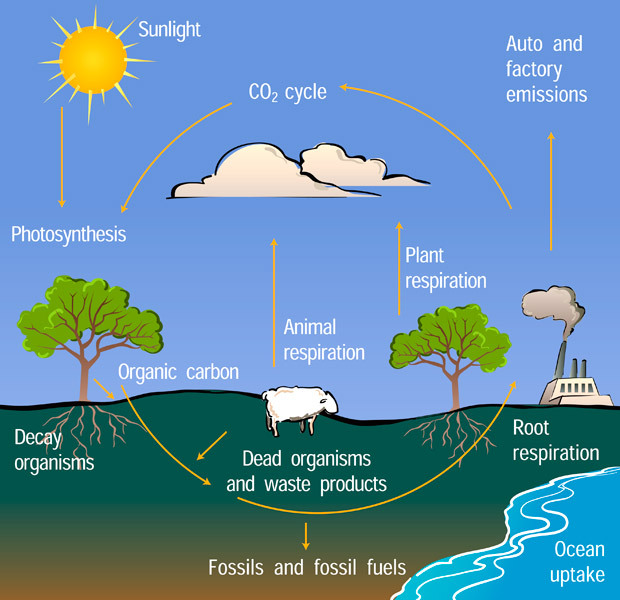 The climate change unit focuses on essential climate literacy principles with an emphasis on weather and climate, Earth system energy balance, greenhouse gases, paleoclimatology, and how human activities influence climate change. 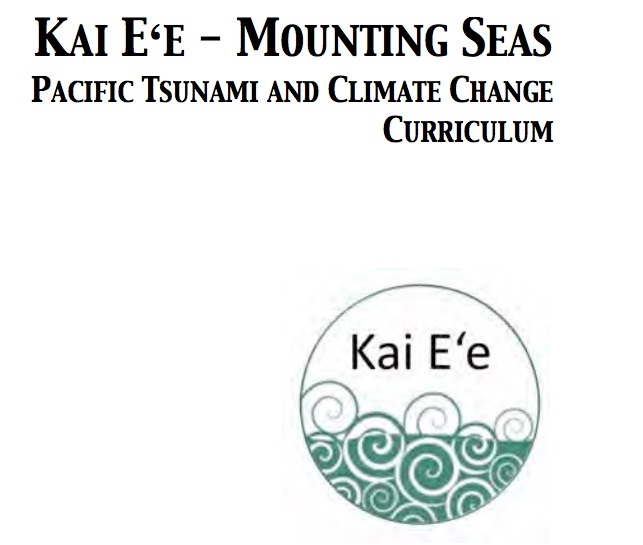 This is a downloadable pdf of middle school Hawaiʻi tsunami and climate change curriculum created by the The Pacific Tsunami Museum in Hilo in 2013. 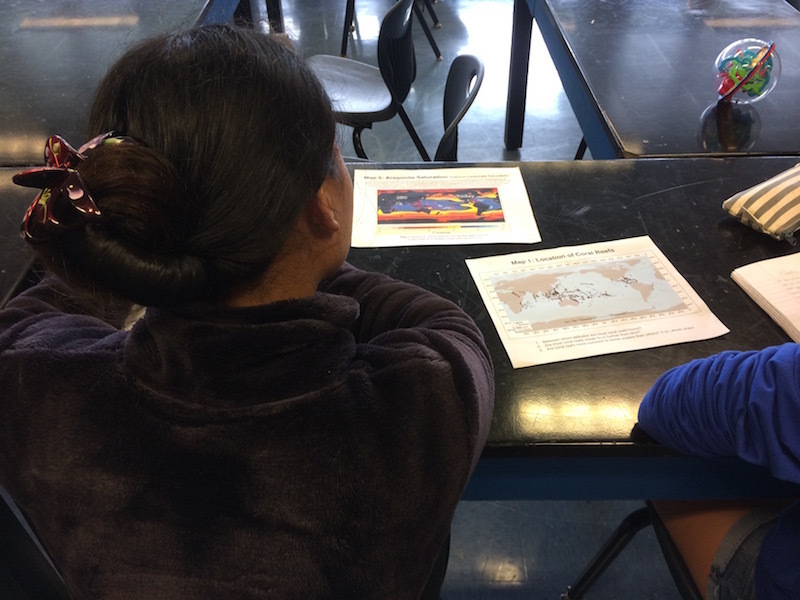 This collection of six lessons focus on climate change in Hawaiʻi and includes notes on relevant science standards (including NGSS) and Nā Honua Mauli Ola (NHMO) Cultural Pathways. 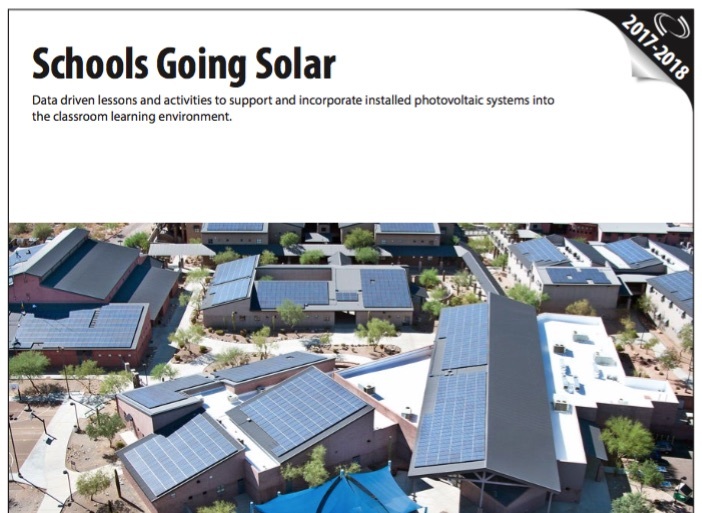 This downloadable pdf by the National Energy Education Development Project (NEED) called Schools Going Solar includes data driven lessons and activities to support and incorporate installed photovoltaic systems into the classroom learning environment. 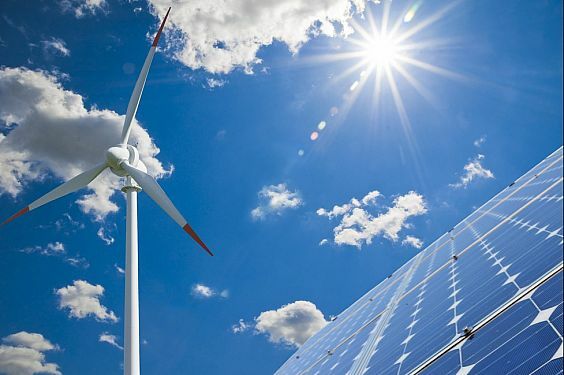 The lessons are for both middle and high school and range from understanding how electricity and solar panels work, to assessing the viability of solar in your region. 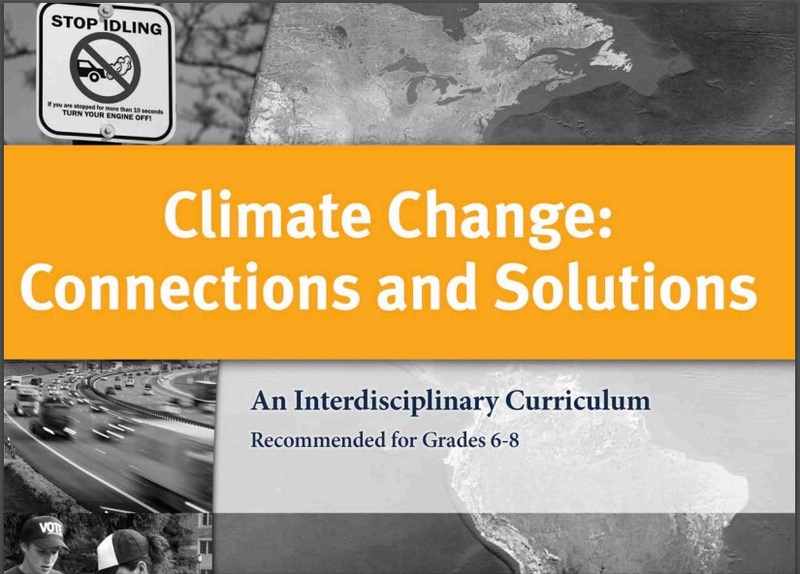 CLIMATE CHANGE: Connections and Solutions is a two week middle school curriculum unit by Facing the Future, a nonprofit, nonpartisan organization providing resources and community action opportunities on global issues and sustainability for teachers, students, and the public. It is a downloadable pdf created in 2007. This section contains educational video collections for students as well as some of our Huliau student films on climate change. Click on the “learn more” links for our descriptions of each resource and click on the photo to go directly to that resource website. Our Climate Our Future by Alliance for Climate Action (ACE) is possibly our favorite video resource ever to share with middle and high school students! You much register for free to watch the 45 minutes video or you can also watch it by chapter. 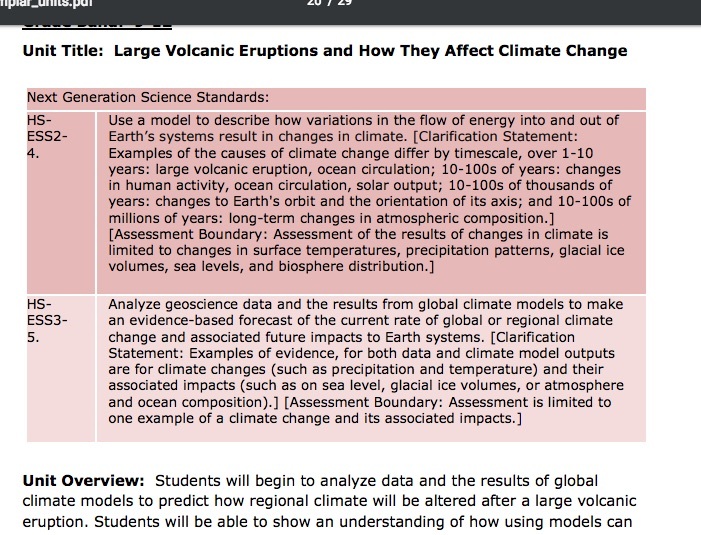 They also have worksheets and lessons to go with the videos and are constantly releasing new shorter videos on recent climate change related topics. The Pacific Institute for Climate Solutions provides this extensive collection of short video lessons on climate science basics, climate impacts, adaptation and mitigation. Individual portions could be used to show students or can be used as background information for teachers. Videos are organized in to lessons with some quizzes built in to test your knowledge. This is playlist of six short films on climate change made by Maui students in our Huliau Environmental Filmmaking Club. The films range from documentaries on coral bleaching to music videos and white board animations. This section contains websites that educational resources for teachers relating to climate change. Click on the “learn more” links for our descriptions of each resource and click on the photo to go directly to that resource website. 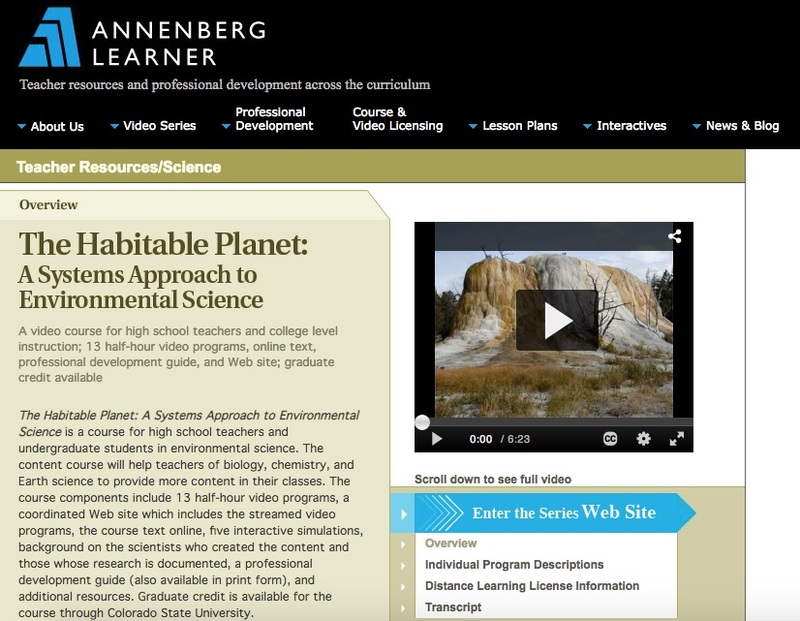 Annenberg Learner offers free on-line courses and videos for teachers for all subjects and grade levels. They have several Earth and Environmental Science related courses as well as courses on teaching strategies and techniques. It is part of The Annenberg Foundation and advances the Foundation’s goal of encouraging the development of more effective ways to share ideas and knowledge. 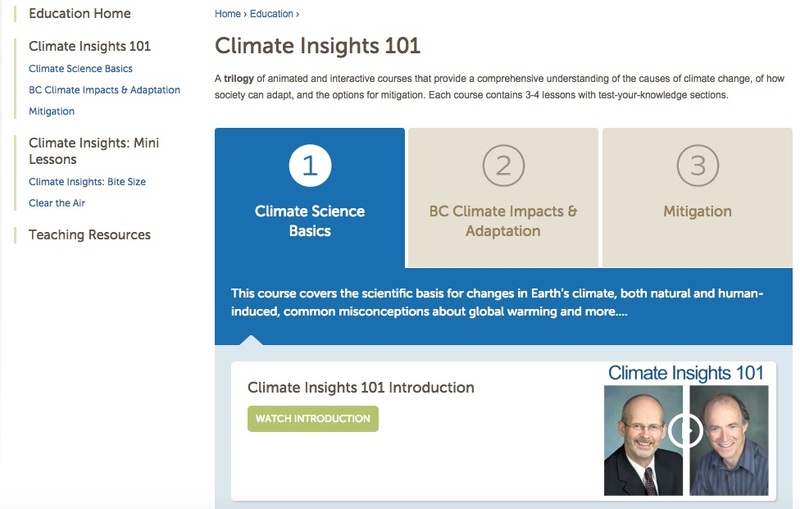 The Dynamics of Climate Toolkit was developed to support those interested in implementing professional development that prepares educators to understand both the science of climate and climate change and the pedagogy for effectively teaching it. 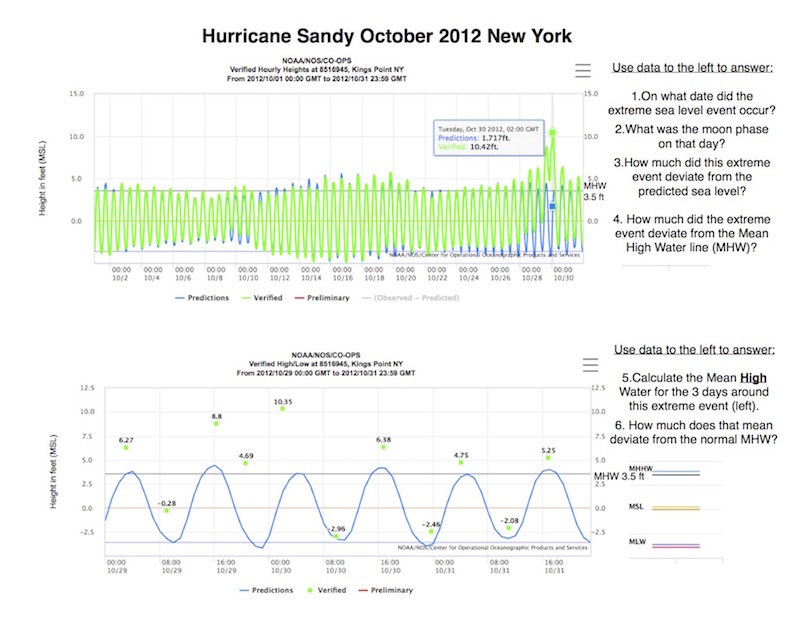 The toolkit includes curriculum for an 8-hour workshop, with activities designed to engage participants in analyzing and interpreting climate data sets and visualizations in a collaborative setting. It also includes detailed lesson plans and evaluation tools. 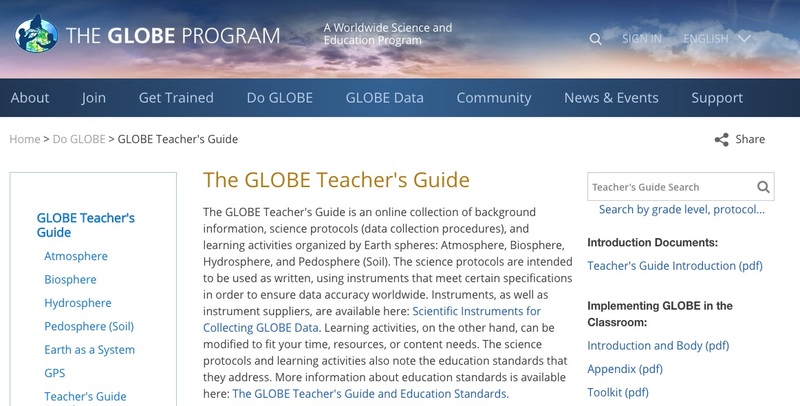 The GLOBE Teacher’s Guide is an online collection of background information, science protocols (data collection procedures), and learning activities organized by Earth spheres: Atmosphere, Biosphere, Hydrosphere, and Pedosphere. The science protocols are intended to be used as written, using instruments that meet certain specifications in order to ensure data accuracy worldwide. Learning activities, on the other hand, can be modified to fit your time, resources, or content needs. They also offer teacher training workshops and and ways to particpate in the active GLOBE community by collecting and entering data, joining competitions and events, and sharing student research. 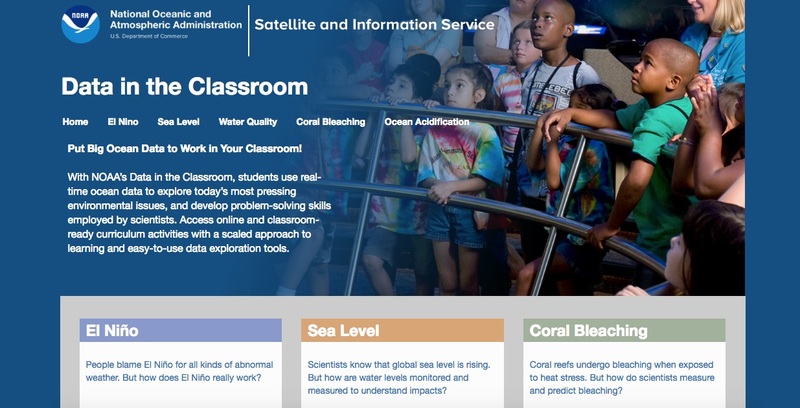 The National Oceanic and Atmospheric Administration’s teacher resource page on climate change includes background information for teachers, webinars, National Climate Assessment Teaching Resources, visuals, videos, demos, experiments, interactive tools and more! Coursera offers free online courses from universities around the world. 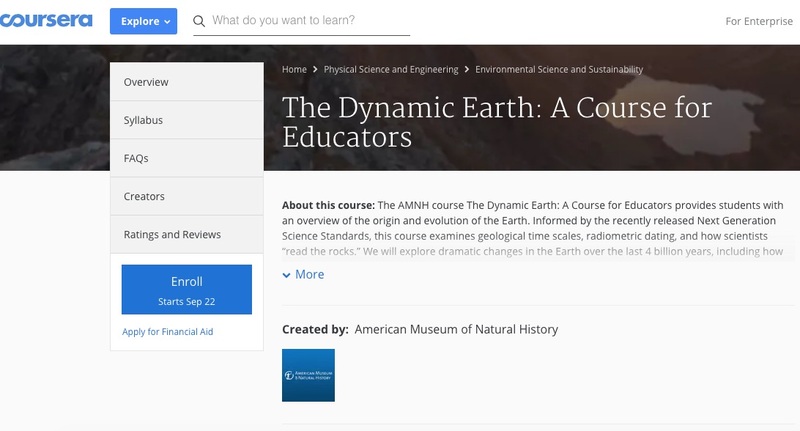 There are at least a handful of courses relative to climate change and Earth science such as The Dynamic Earth: A Course for Educators, Our Earth: Its Climate, History and Processes, courses in climate modeling and more. NASA’s Global Climate Change: Vital Signs of the Planet website provides a great overview of climate change facts including useful visuals based on NASA data and research. This is a great resource for teachers to get a condensed overview of climate change causes and impacts. It also can be a good place to find graphs and visuals to share with students. It also includes the Climate Time Machine, a series of visualizations showing how some of Earth’s key climate indicators are changing over time, and Images of Change, a gallery of before and after images of changes on Earth.